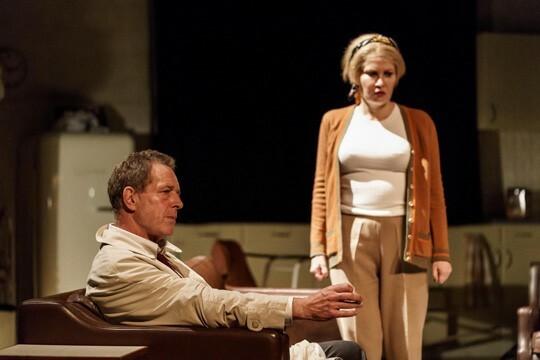 WAIT UNTIL DARK is set amidst the social turbulence of 1960s London and follows the story of Susy, a blind woman (played by blind actor Karina Jones) who, left alone in her apartment, becomes the victim of an elaborate scam hatched by a group of conmen. Left to fend for herself, Suzy eventually finds a way to turn the tables on the conmen and give them a taste of life in the dark. Frederick Knott, best known for writing Dial M For Murder, wrote WAIT UNTIL DARK in 1966. Audrey Hepburn starred as Susy in the 1967 film adaptation, for which she was nominated for both the Academy Award and Golden Globe for Best Actress and the film is often ranked as one of the top 100 scariest films of all time. The cast of this new stage play, which is at Cardiff’s New Theatre from Tuesday 14 – Saturday 18 November, also includes Jack Ellis (Prime Suspect, Bad Girls) and Oliver Mellor (Coronation Street). Tickets are available on 029 2087 8889 and newtheatrecardiff.co.uk.